The Dutch boatyard Oceanco is constantly committed to the search for avant-garde solutions in its production of super-yachts, leading to close collaboration with the German boatyard Kusch. This German boatyard specialises in the production of merchant ships capable of sailing the seas all over the world in any period of the year and in any weather conditions, experience that it transfers into large yacht production. All the pleasure boats built by Oceanco are the result of the collaboration between the two boatyards and are the best expression of this encounter between the skills behind the large hulls typical of the German boatyard and the high level of professionalism of the Dutch workforce in fittings and finishing details. Over the past ten years, Oceanco has come to the attention of the international public thanks to the quality of its yachts over 50 metres in size. The past two years have seen the boatyard launching very important boats like "Constellation", 80 metre, "Al Mirgab" 95 metres and others of which the most recent is "Lady Lola", a pleasure boat we have already mentioned in our pages. 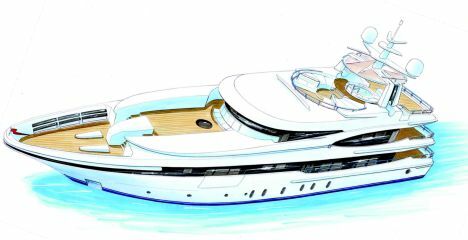 Among the projects in the pipeline at the two structures of the boatyard there is also the P-270. This is a 43-metre yacht that Oceanco intends to be the sum of all its experience to date. The P-270 is produced with standard bottom and upper works, but its strong point lies mainly in it being a luxury yacht suitable for ocean cruises in comfort and safety, despite having a relatively contained displacement. Oceanco has chosen steel for the hull and light alloys for the upper works, thus enabling optimum management of weights and permitting ample volume without making its overall appearance seem heavy. On board the new 43-metre Oceanco we can in fact find the same equipment which is usually found on large boats, even those with a hull 10 metres longer. Waterlines and design were developed by the boatyard while the interiors will be designed by an architect yet to be made known, with the task of following all the owner's instructions in order to create rooms that meet the future owner's needs. Details of the project include exploitation of the whole beam of the hull for the internal volumes from bows to amidships, a solution resulting in plenty of covered space. As far as it concerns the outside areas, the P-207 can count on a bow area occupied by a zone reserved for relaxation and sunbathing, in addition to the other three located on the stern ends of three different decks. On the second upper deck there is a sofa area with circular Jacuzzi tub, partially protected by an original roll bar, astern of which we find a generous sun deck with access to the lower deck. Here we find an area for large dinners, parties and other events which can be attended by many people, partially covered by the upper deck. The cockpit has lateral stairways set into the structure, offering comfortable, safe access to the stern bridge. At the moment we do not have exact indications regarding the boat's interiors; we can only report what the boatyard has told us, that is that there will be five cabins for the owner and his guests and five cabins reserved for the crew. For motorization the boatyard is oriented towards two 820 HP Caterpillar 3508 DITA C-Rating engines, with which the P.270 can sail at a maximum speed of 14.2 knots and at a cruising speed of 11.5 knots. For further information please contact Oceanco; Gildo Pastor Center; 7 rue du Gabian; Monaco, MC98000; tel. +377 93100281; fax +377 92056599; website www.oceancoyacht.com; e-mail oceanco@oceanco.mc. Fuel tank capacity: 55,000 litres.